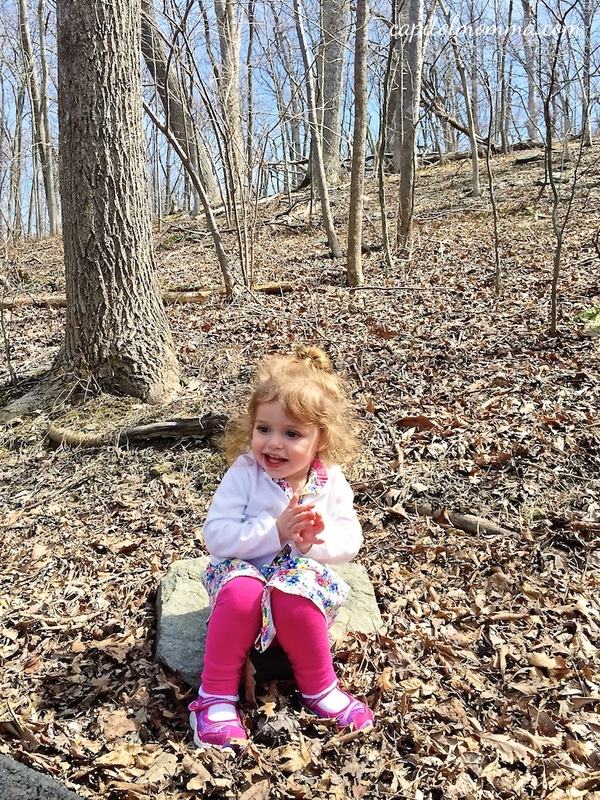 My girls have been so excited to spend time playing outdoors this spring, especially after the winter we had. 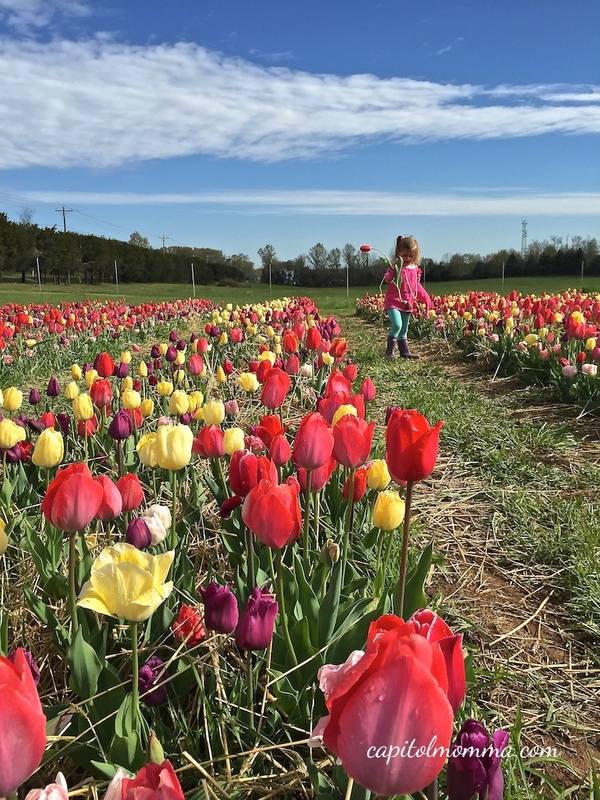 They absolutely love looking at (and picking) flowers. 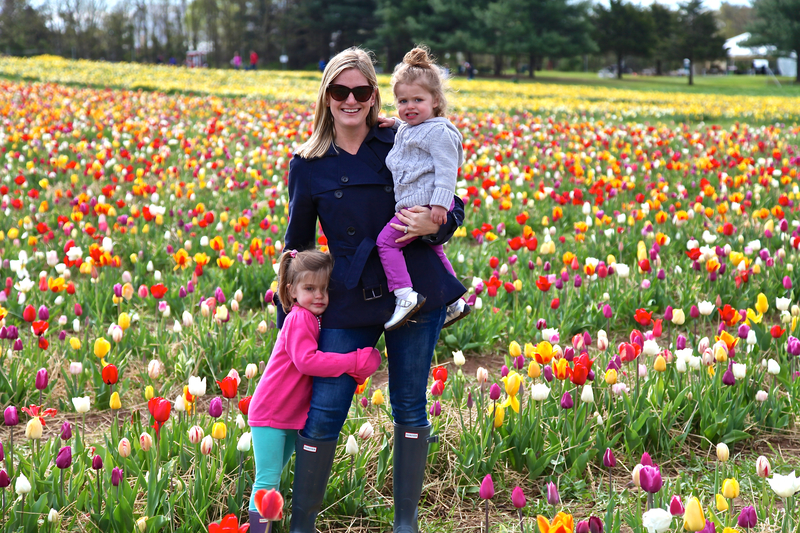 So, last week on an exceptionally beautiful day we headed out to Vienna, Virginia to explore Meadowlark Botanical Gardens. Inside the visitors center are a few tanks with turtles and fish, so we stopped to look at those first. After paying the entrance fee, we headed outside to explore the gardens. 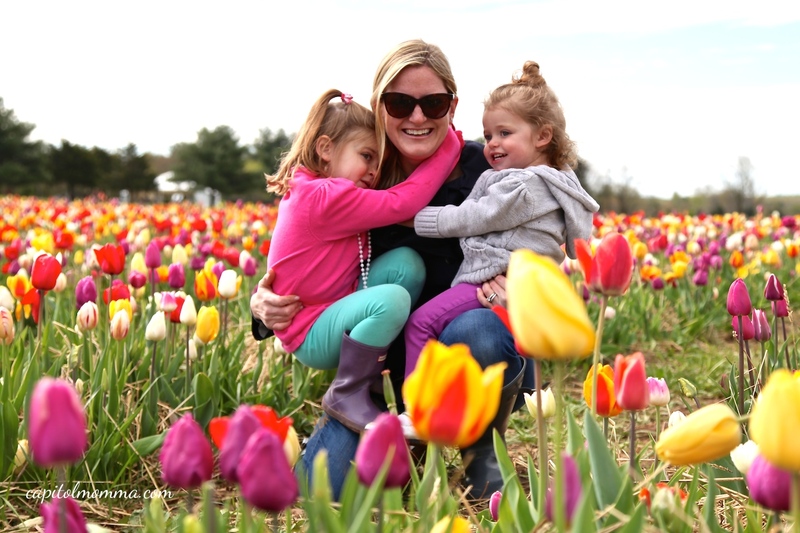 At first, Clara and Mae were disappointed when I told them they couldn’t pick any of the flowers but they got over it quickly. There was so much else for them to look at and do here. And we did find a few wildflowers growing by the lake that I let them pick. 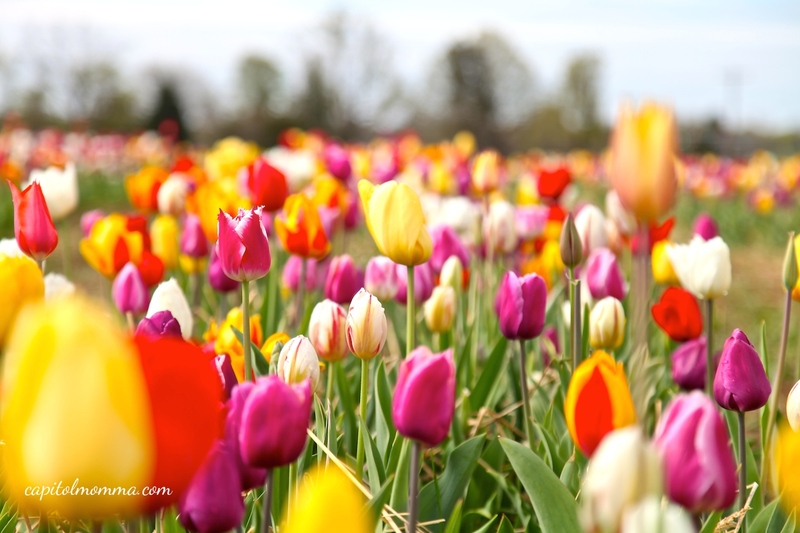 That seemed to keep them satisfied with their flower picking desires! We stopped to admire the fairy garden right outside of the Visitors Center. Then I told Clara that there was a children’s garden area, so of course that was the spot she wanted to check out next. We took the path down to the whimsical area next to the Gardiner lake. 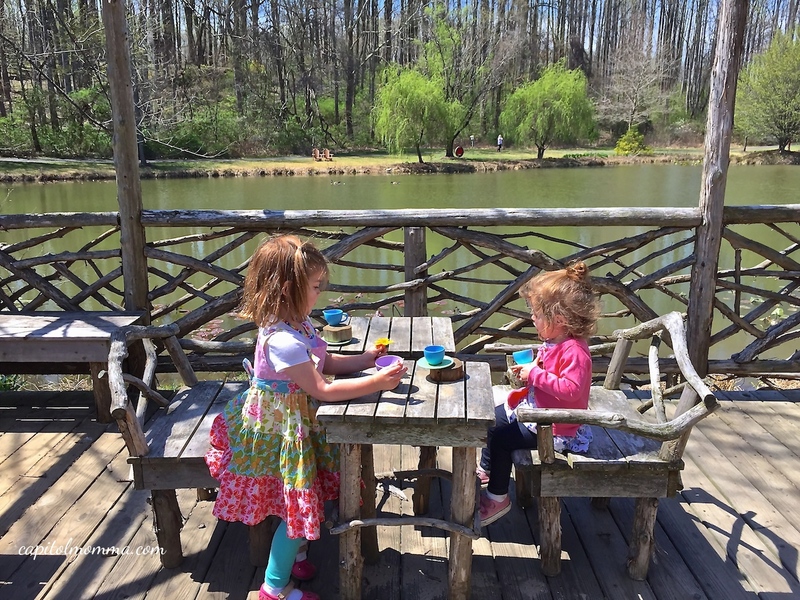 My girls were immediately drawn to the deck area that had a little wooden chairs and a table with tea cups. Such a perfect spot for a lakeside tea party! There is a second tea garden area with another cute table and chairs. 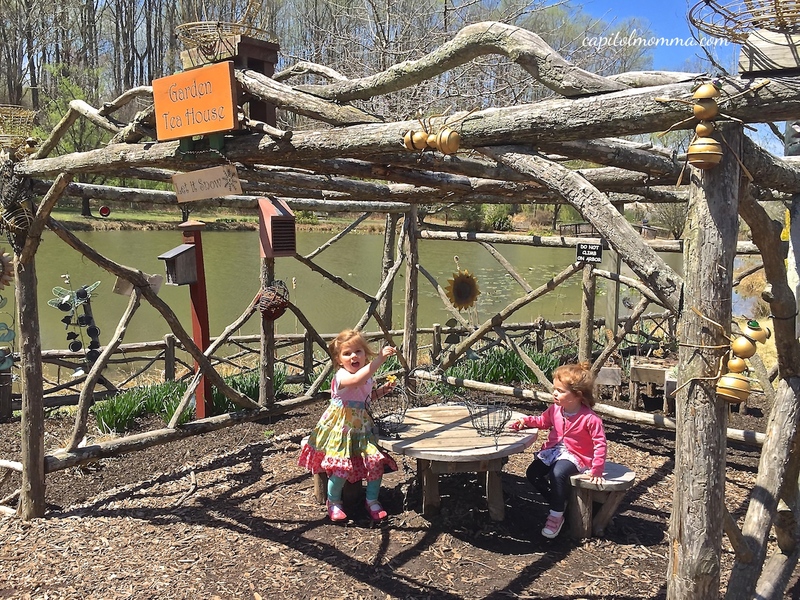 The children’s garden also has “touch and smell” areas for the children to explore. 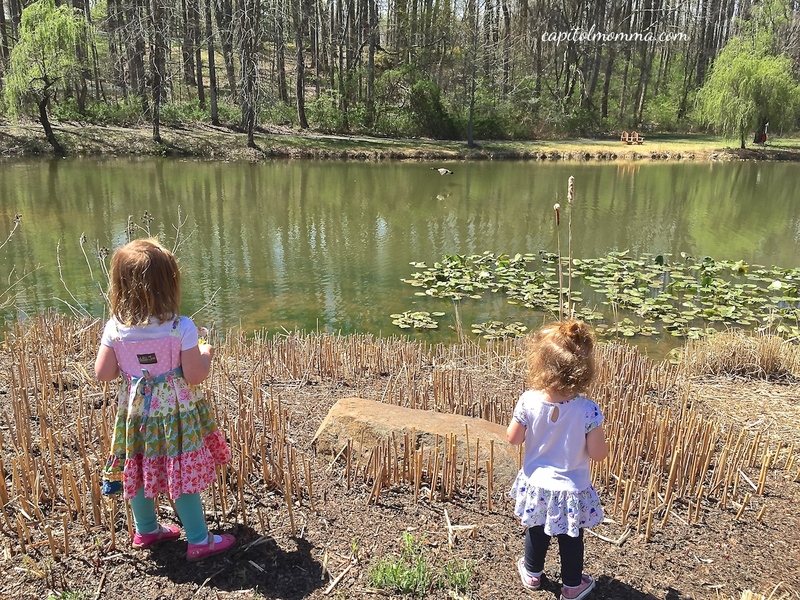 My girls loved watching the geese in the lake and spotting all the turtles – lots and lots of turtles! Clara had fun counting them all. 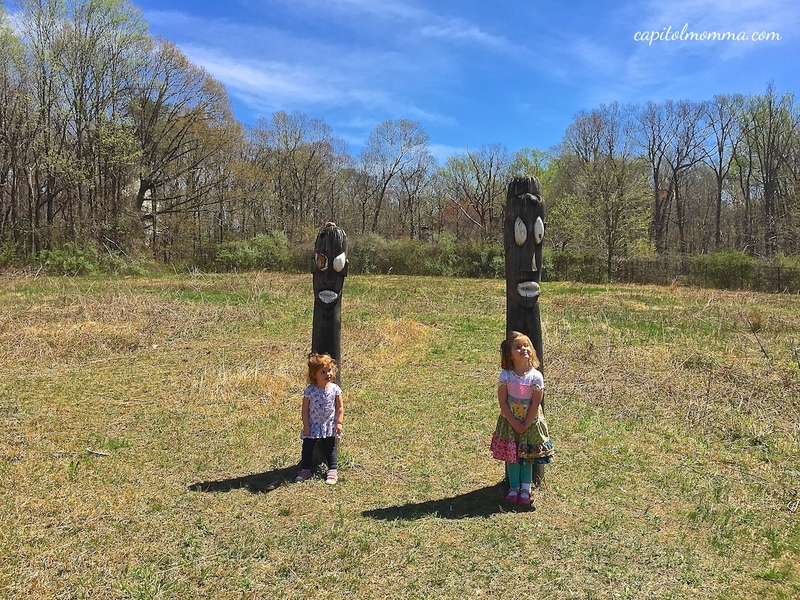 From the children’s garden, Clara spotted these totem poles out in an open field and ran over to them. Mae tried to follow as quickly as she could! It looked like these were put there just for them – big sister and little sister totems! 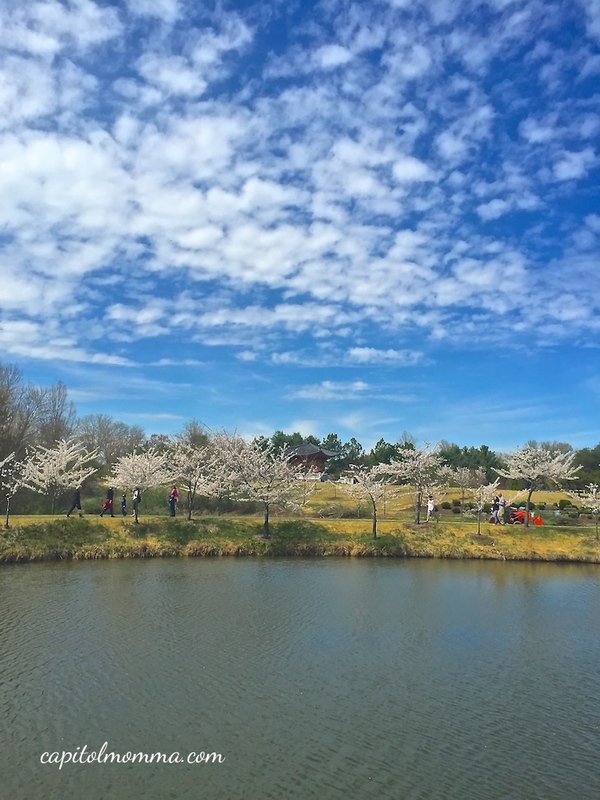 We continued around the path and enjoyed the cherry blossom trees along Lake Caroline. 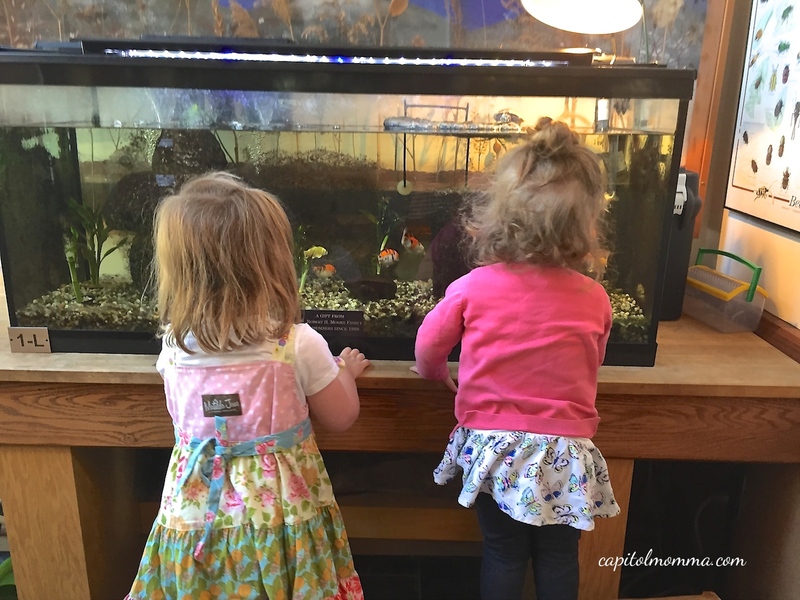 We walked out onto the gazebo and the girls loved looking at the Koi fish. By this point, we had been at the gardens for close to two hours and Mae (who hadn’t yet napped) was on the verge of a meltdown. So we skipped the Korean Bell Garden and a lot of other areas. 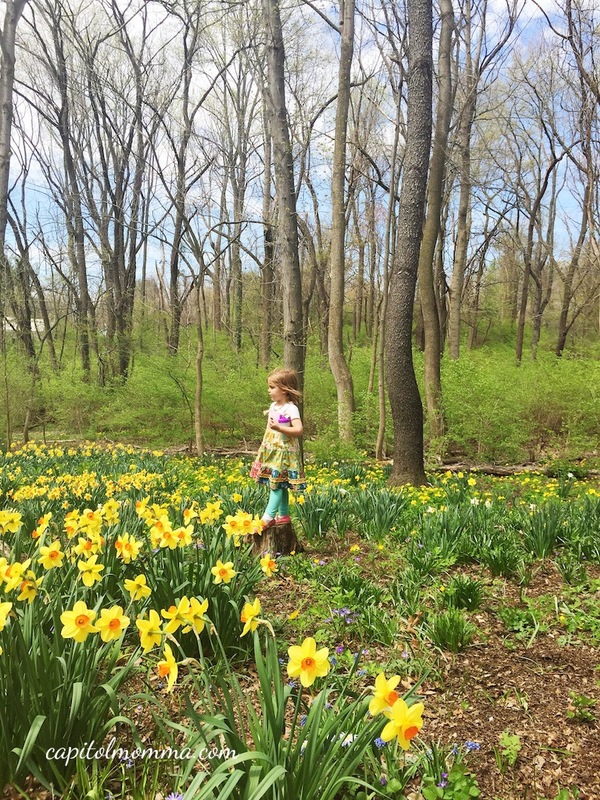 We started to walk back towards the visitors center but stopped briefly at this garden full of golden daffodils. It was too pretty to not enjoy. 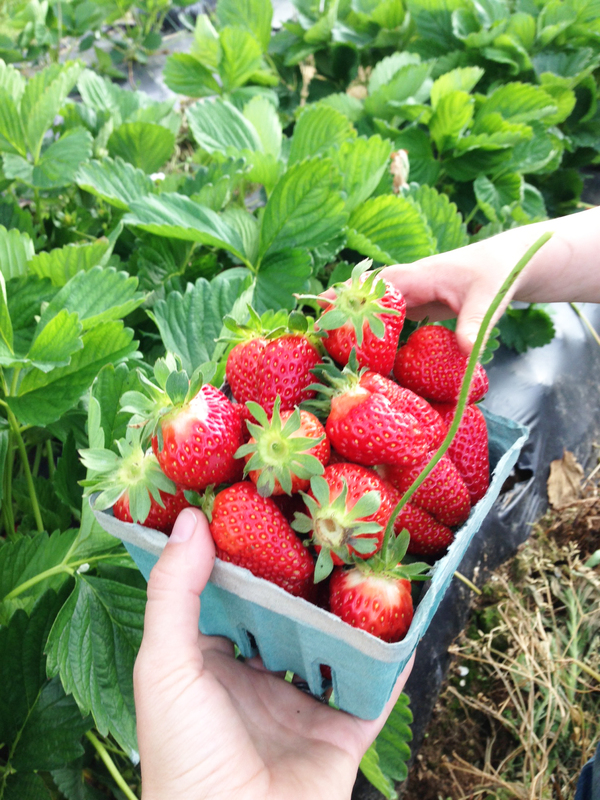 There is so much more to explore at Meadowlark! We will definitely return to see everything we missed during our first visit. I imagine that it’s a different experience with each different season. 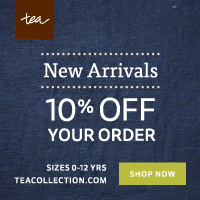 •Bring a stroller for little ones. 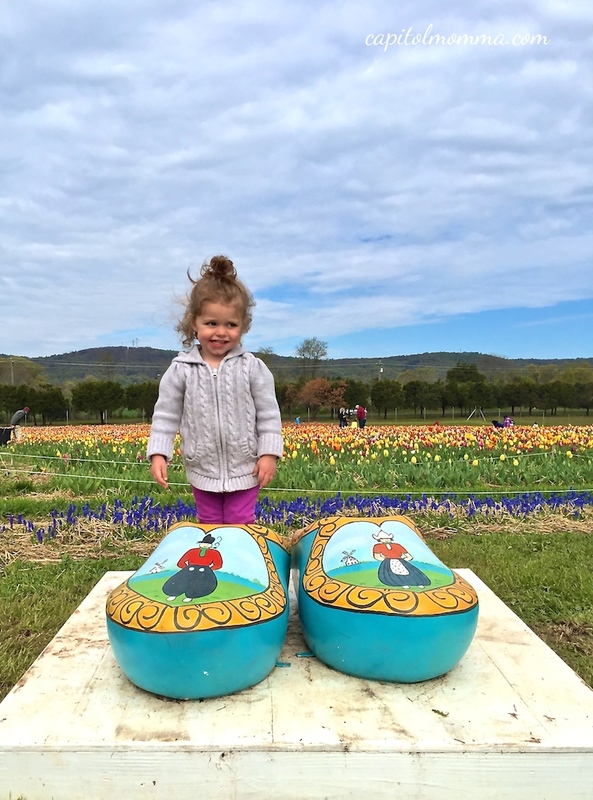 It is a lot of walking, so even if they don’t want to sit in the stroller at first, they might want it towards the end of your visit. There is a paved pathway throughout. •There is a gift shop in the visitors center where they have drinks, snacks, and small toys available to purchase. 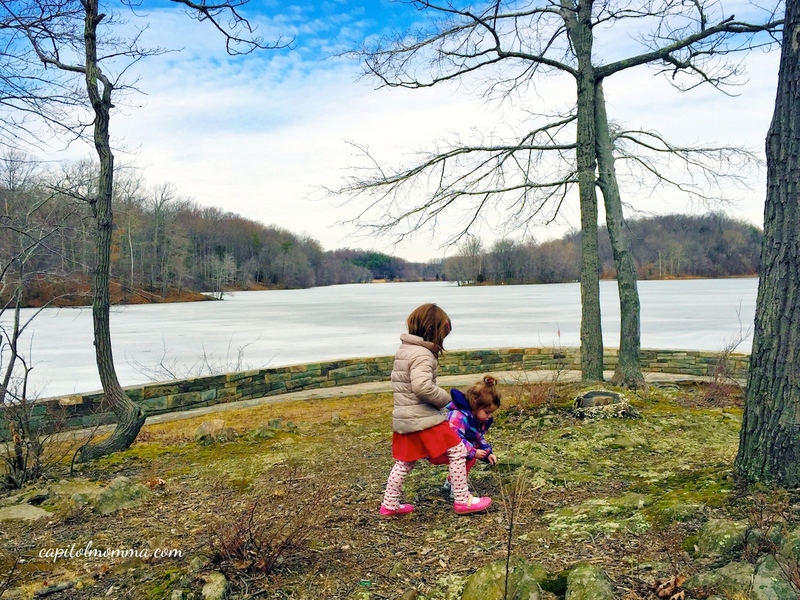 A few weeks ago, I took the girls to explore Lake Needwood for the first time. I had driven past it several times before and finally decided we needed to check it out. At the time we visited, the lake was still frozen and strikingly beautiful. Clara and Mae had a great time looking for “treasures” and had quite the collection of sticks, leaves, and acorns. After posting this photo on Instagram, the author of Hiking Along recommended I visit nearby Lake Frank. 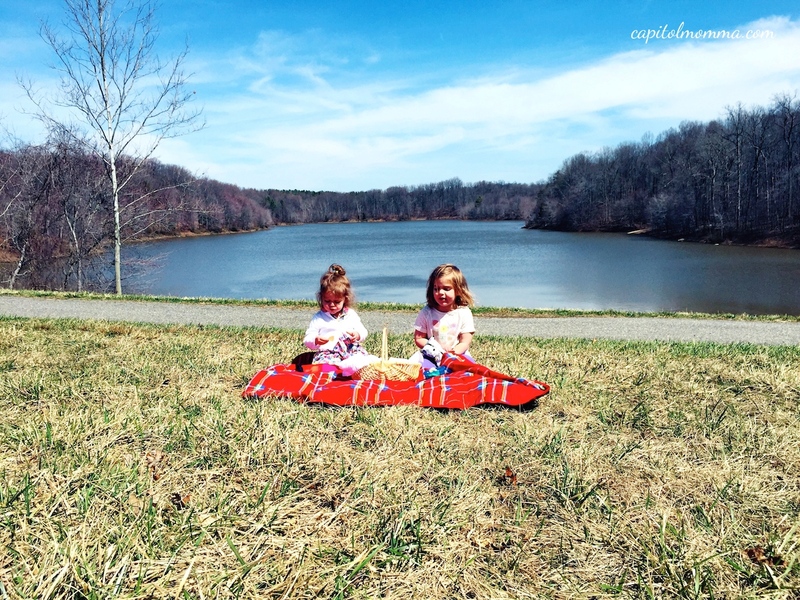 So, when when Mother Nature gave us a gorgeous day last week I thought it would be the perfect opportunity to take the girls for a picnic and hike. 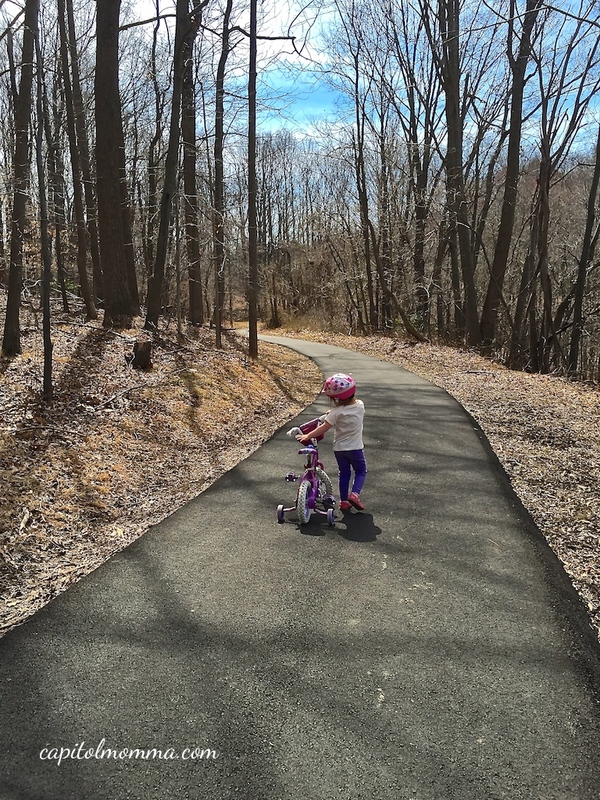 I pulled into the parking lot and noticed there was a paved path leading into the wooded area so I decided to let Clara ride her bike. We started out on the path and it got very steep so I helped her walk her bike down the hill where the path became level. Then we came to an incredible view and decided this was a perfect picnic spot. It is about 1/4 of a mile from the parking lot to the lake. After the picnic we continued along the path and the girls wanted to feed the ducks, so we walked down closer to the lake. It is really a quiet and peaceful area; such a nice haven from suburbia. 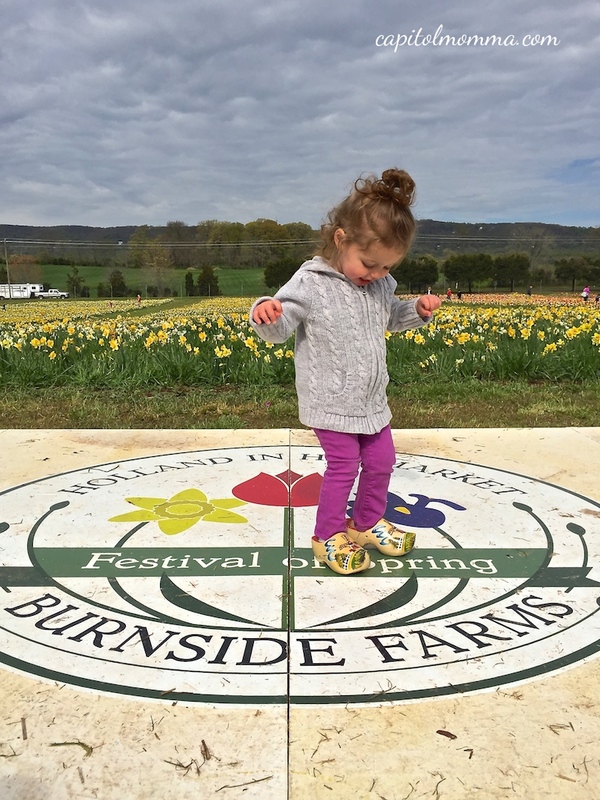 Many Montgomery County residents don’t even realize it exists. We only walked about a quarter of the way around the 54 acre lake before Clara got tired, so we turned around and headed back to the parking lot. The pathway is paved for first section of the trail but is unpaved for the remaining 2/3 of the trail. 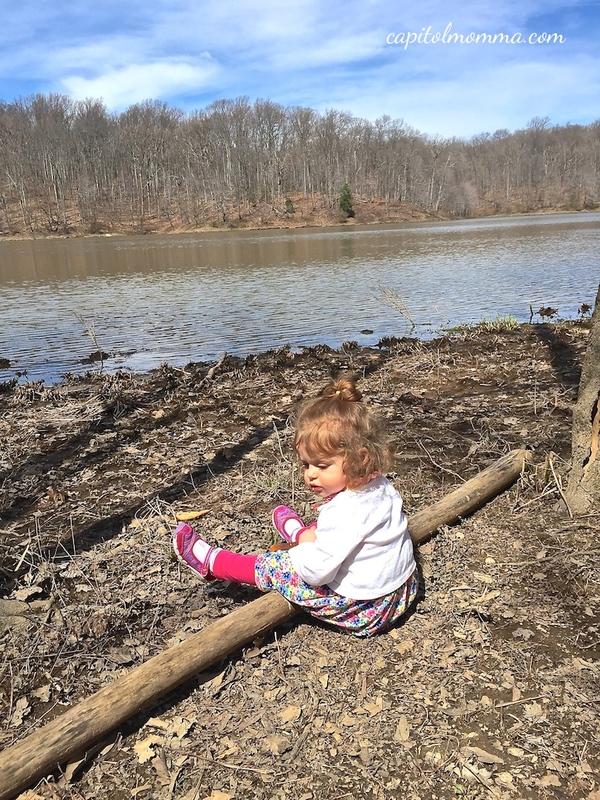 The trails can also be accessed from Meadowside Nature Center, which is another great place to take kids. The best part about Lake Frank is that its so close and easy to get to! 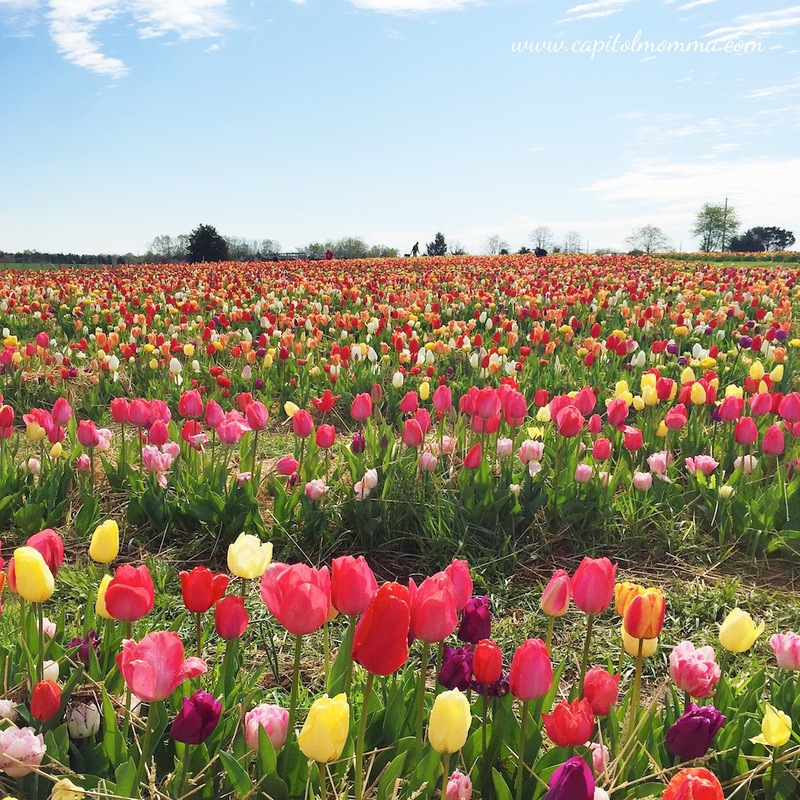 It’s located in Derwood, just east of Rockville, so it is only a 15-20 minute drive from Bethesda/Potomac. Sometimes it’s just nice to escape traffic and crowds and find a peaceful spot like Lake Frank. There is a lot more here to explore. 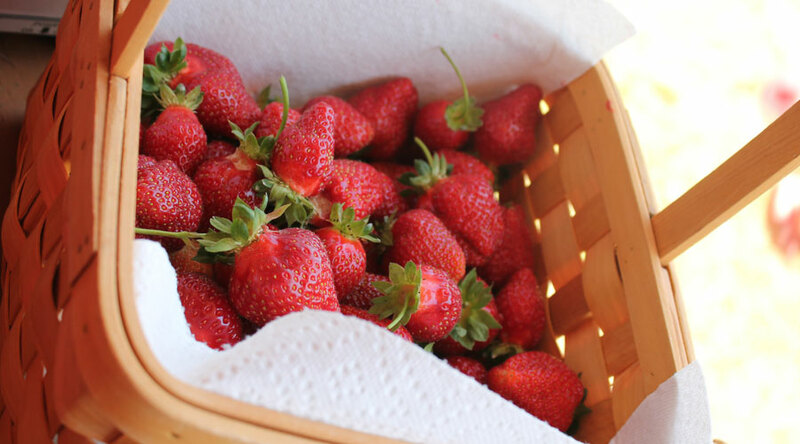 So we will definitely return for more hiking, bike riding and picnicking this summer!